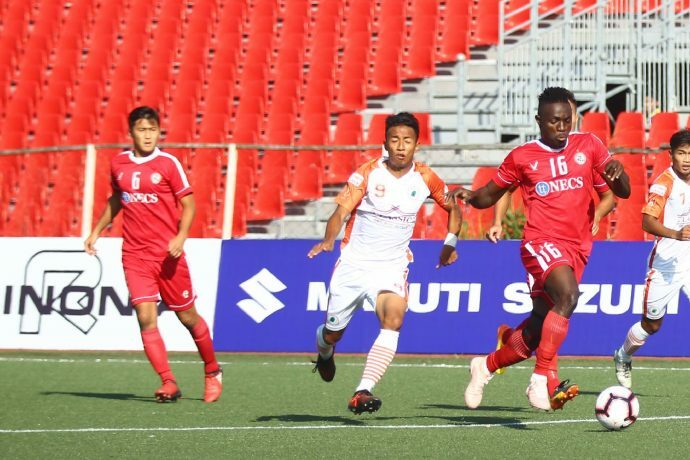 The second Northeast Derby of the 12th Hero I-League played between Aizawl FC and NEROCA FC at the Rajiv Gandhi stadium in Aizawl ended in a goalless draw. Both teams had their chances in a game where hosts Aizawl had a slightly better of exchanges, but a goal eluded them throughout the 90 minutes. Both Aizawl and NEROCA now have two points from three games and remain on the bottom rungs of the standings. The second half saw more end-to-end football and was clearly more entertaining but both Gurpreet in the Aizawl goal and the NEROCA custodian Maouro Boerchio managed to return their first clean sheets of the Hero I-League campaign. Gift, coaching for the first time against his previous side, chose to field an unchanged eleven from the previous game against Mohun Bagan. Fraile meanwhile effected four changes into the eleven which started the last game against Gokulam Kerala. The best among them was in the dying minutes of injury time when his free-kick from the left flank found Valpuia with a free header inside the box but he headed straight to the keeper. Aizawl FC will now play host to defending champions Minerva Punjab FC on November 10, 2018 and NEROCA will travel to Srinagar to challenge Real Kashmir FC on the next day. Mumbai City FC captain and goalkeeper Amrinder Singh talks about the Indian Super League’s impact, his favourite fans in India and how he was a STRIKER once. The post VIDEO – Superpower Football: 1v1 with Amrinder Singh! appeared first on Arunava about Football.